This post may contain affiliate links, which means that if you click the links and choose to make a purchase, I will earn a commission. This commission comes at no additional cost to you but does help me earn enough to support the cost of this website. Please know that I only link to items which I personally use and feel that I can confidently endorse. Your support by clicking on these links is greatly appreciated. 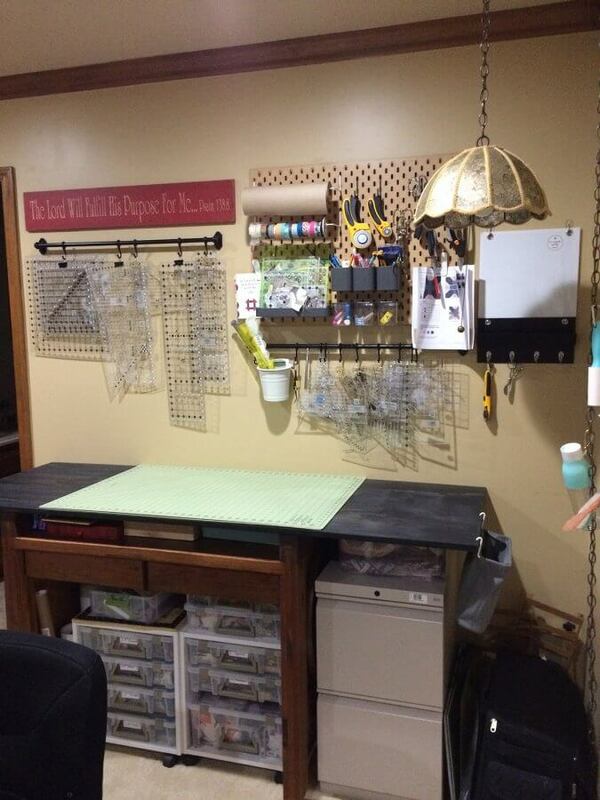 Is a Dedicated Sewing Zone REALLY Necessary? 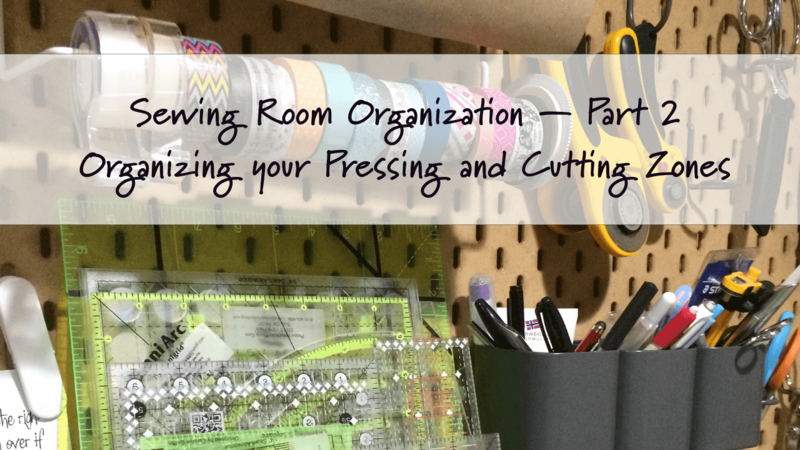 You DO NOT need a big space in order to have an organized sewing studio. While a big space might live in our dreams, I think it’s important to keep in mind that bigger spaces usually mean more distance between your various work zones. 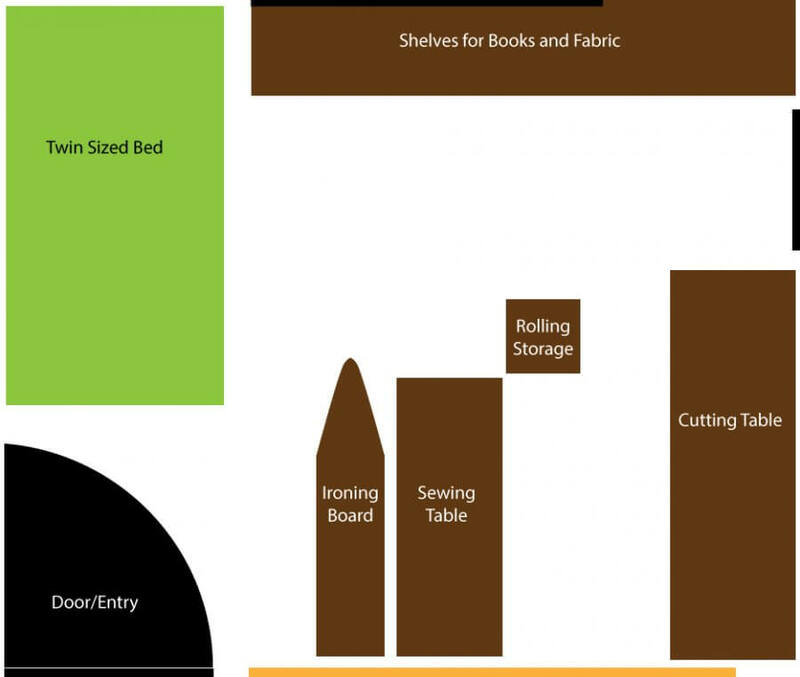 So, a smaller area might actually be more efficient — especially if it’s well thought out. Also, I’ve lived long enough to figure this out: the bigger the space, the more clutter I am apt to bring into it! AND, the more stuff I have, the more difficult it is to keep it clean and free from distractions. I think the key to a small space is to make it work efficiently for you by carefully thinking through how you set up your work zones and being very selective about the tools you bring in. My space is a nice size, but it certainly isn’t huge. It measures approximately 11.5′ x 13′, but it also does double duty as a guest room. A twin bed sits in the corner opposite my sewing area. My room has evolved quite a bit over the last 6 or 7 years, and I’m sure it will continue to evolve. 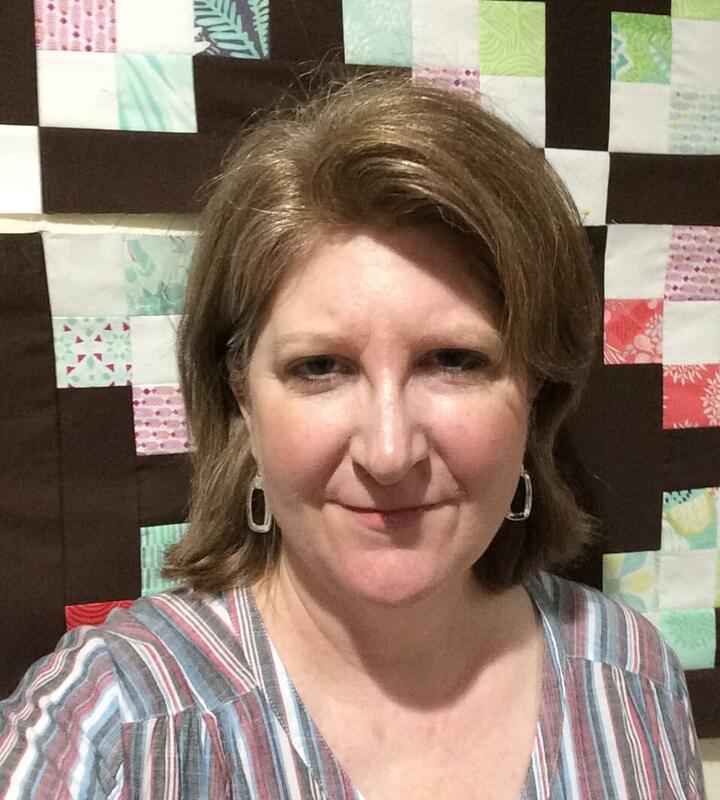 (FYI: When my son gets married next year, I hope to move the bed to his room, and would like to set up a sitting area with a TV so hubby or friends can hang out while I sew OR so I can sit there to do handwork.). So without any more delay, let’s walk through the work zones in my sewing studio. Maybe you’ll see an idea in here that will work for you. I recently purchased a new ironing board cover, as my previous one was getting scorched and faded. There are lots of pretty ones on the market, but this time around, I decided to go plain jane. 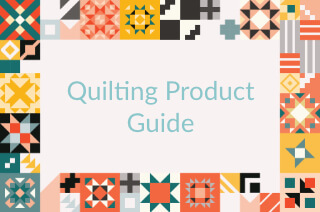 While I love pretty designs, it’s become very important to me to not have visual distractions when I’m working on my quilts. I feel like I can see and evaluate my work better if I don’t have a competing design to contend with as I work. (Crazy, I know!) The feature I really like about my new cover is that it has a layer of wool built into it. Wool, in case you didn’t know, is AWESOME at radiating heat and actually helps deliver a nice clean press. 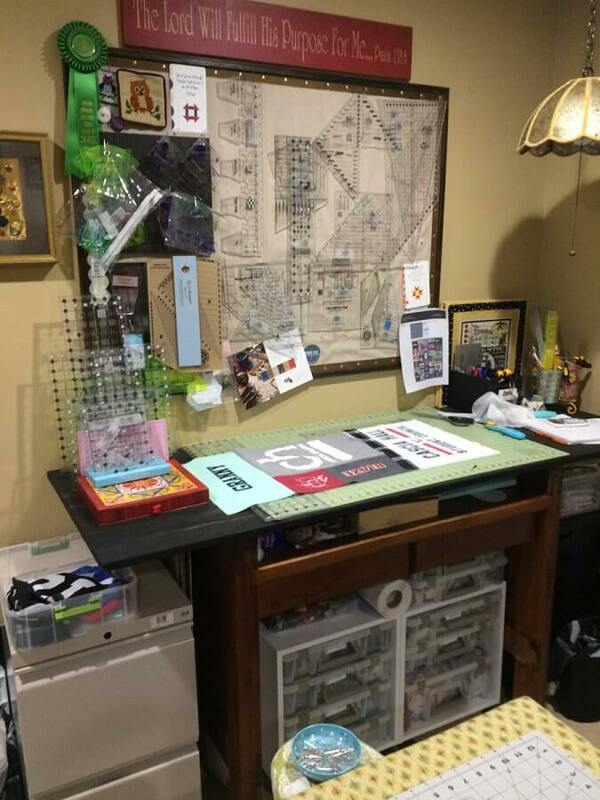 The cover I purchased is made by TIVIT, is available in multiple sizes, and I’ve linked you to it in the image below: In addition to my main ironing station, I also keep a “mini” pressing station beside my sewing machine that I can pull out when I’m doing patchwork. 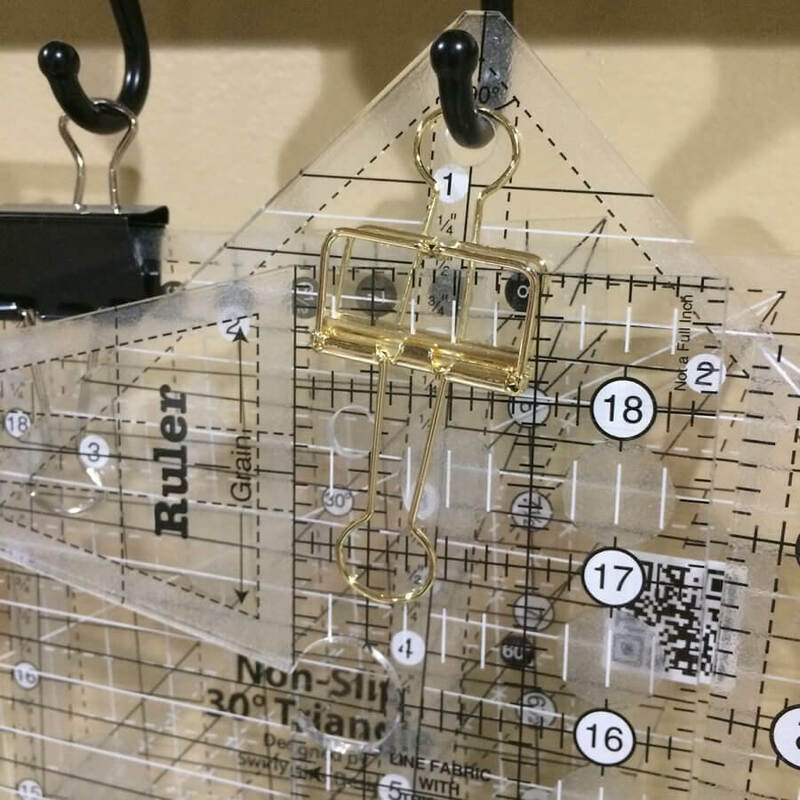 This saves me a lot of time since I don’t have to hop up and down and travel from my machine to my ironing board a jillion times. (Although, I could probably use the steps…) This mini station consists of my mini wool pressing mat and my travel iron. (The images below are linked to Amazon). Earlier I stated that I wish my ironing station was larger. 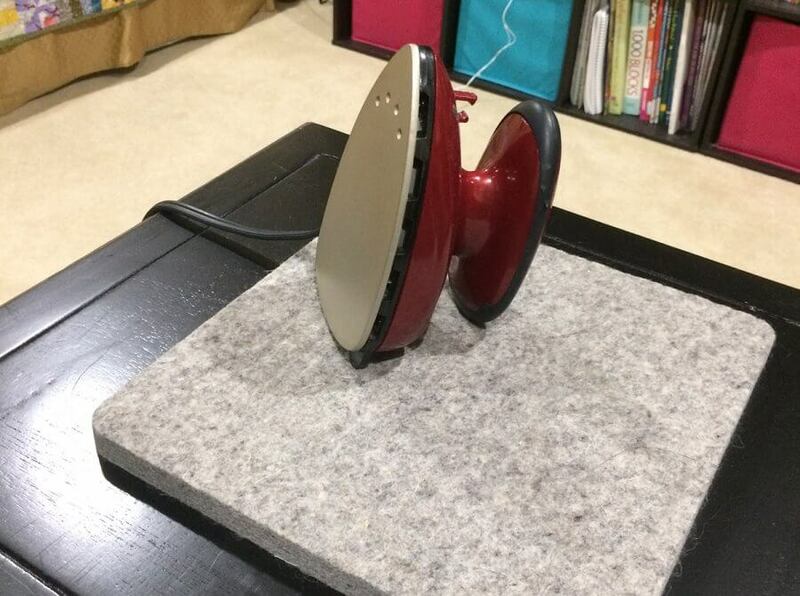 A few years back, I had a great ironing station setup. It was like having an ironing island right there in the middle of my room. (I’ve looked EVERYWHERE for a photo of it, but I guess I never took one, and that’s a shame because it was pretty awesome!) Unfortunately, I had to take it down because I needed the space so this room could double as a guest bedroom. (I still have all these components and hope to put it back together when we no longer need the bed in that room.) 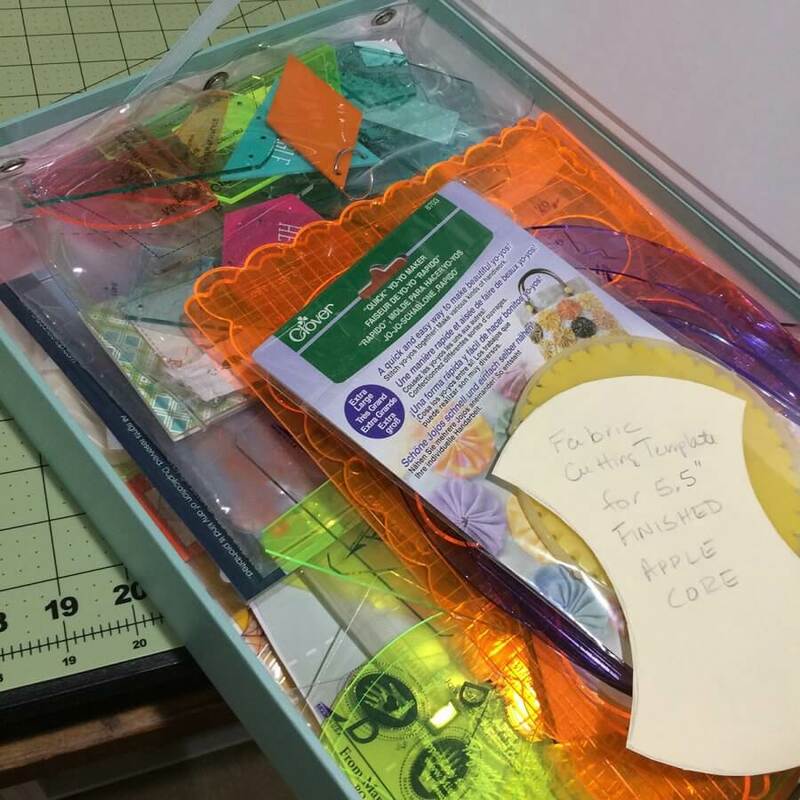 If you have the space for this kind of setup, it’s wonderful to have because the larger surface makes it easier to work with large sections of a quilt. It’s fairly easy to set up, and here is how I did it: I used two 3×2 storage cubbies and set up them up about 36″ apart from each other, tall side up. (Something like the unit shown below would work great.) Then I centered a large board (approximately 50″ x 28″) over the two units. I covered the board in several layers of batting and heat resistant fabric and then a layer of pretty fabric. I then screwed some 12″ pieces of 1″x 4″ boards underneath to act as “stoppers” so the board would stay in place between the cubbies. 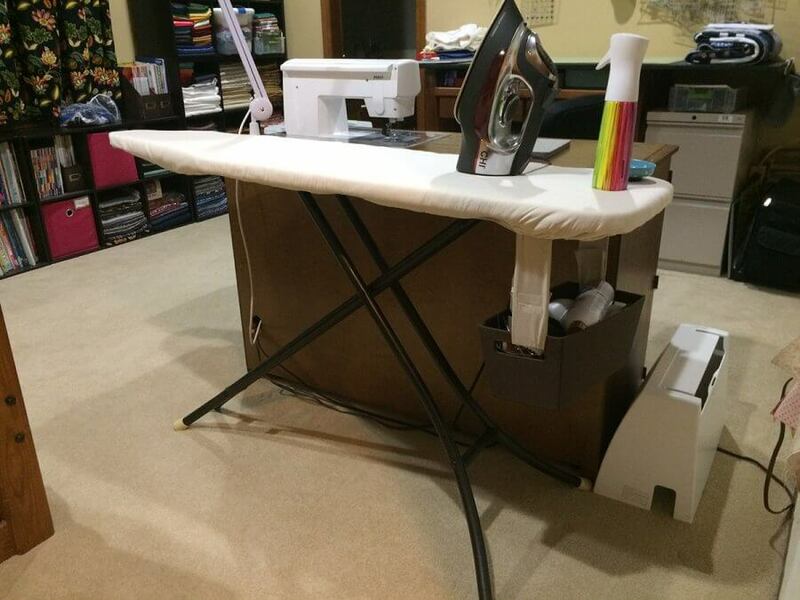 One last thing about my “ironing station.” Several people have asked about my iron. As a quilter I have gone through more irons than I can count, but I’ve been especially happy with the iron I am currently using. It’s a CHI, the same company that makes those wonderful flat irons you use on your hair. It gets super hot, and glides over fabric like butter. But to be totally up front, it’s not perfect. This is my 2nd CHI. The finish came off the first one when working with some fusibles for some applique. CHI replaced the iron no questions asked, so I am still a happy customer. I ordered a larger Teflon pressing sheet and will be more careful to keep my iron protected when working with fusibles. I’ve decided that there just isn’t any such thing as the perfect iron any more (and if I could get my hands on a good one made in the 1950s I’d pay good money for it!) But the CHI and me are getting along pretty good. Please note, you cannot use standard peg board accessories with this pegboard. 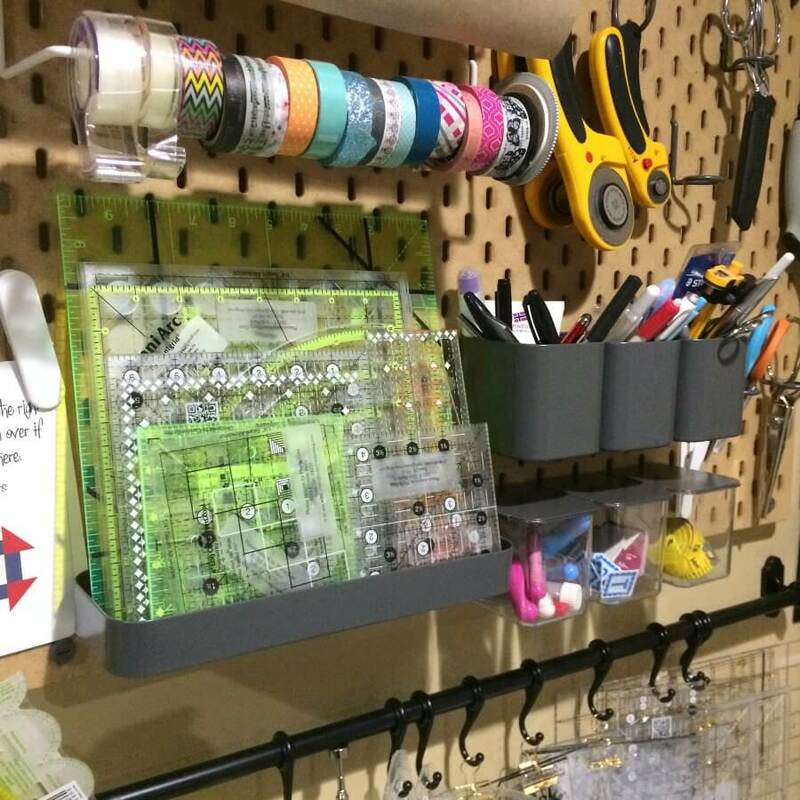 You will need to use IKEA designed pegboard accessories (but they are very well designed). Now a little about the cutting table itself, which is actually a child size desk. This was the desk that we got our son when he was about 4 years old. (Does anyone remember CARGO furniture? We have a whole set of it! We bought it 2nd hand and it’s got to be at least 35 years old. And let me tell you…It’s INDESTRUCTIBLE!) 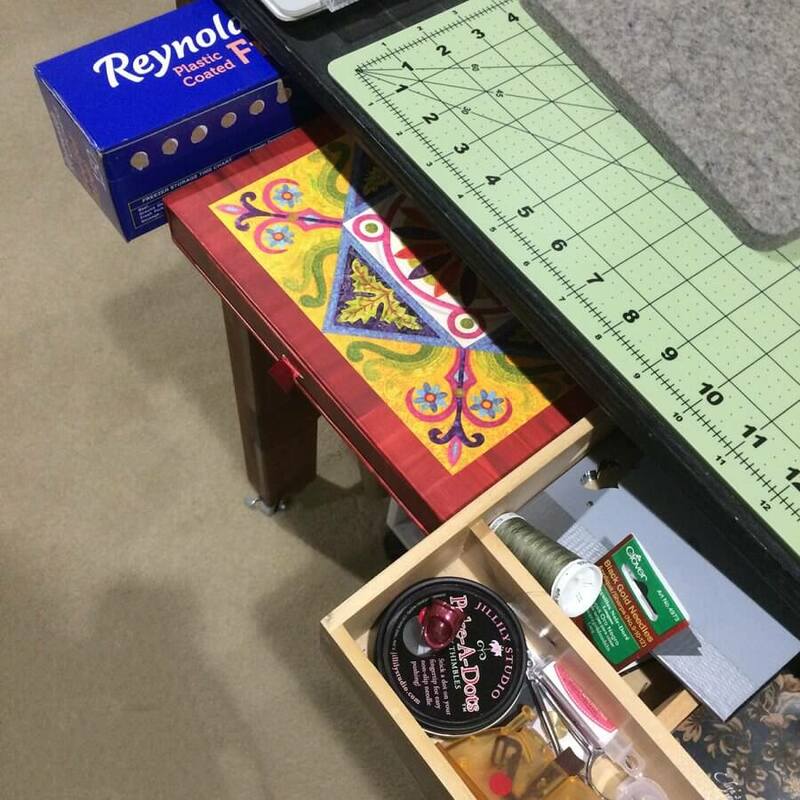 When I first started quilting, I commandeered the desk and put 4″ casters on the bottom of each leg. 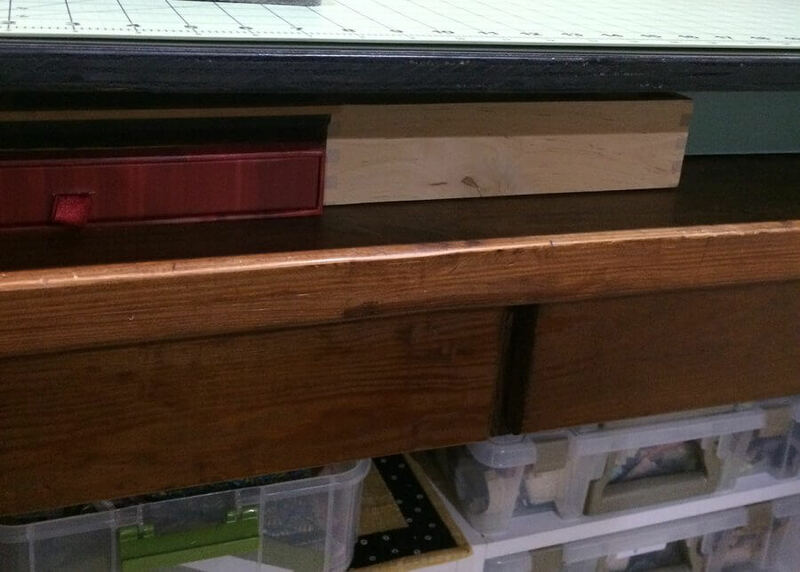 Now, the top surface of the desk is surrounded by a ledge, which was originally designed to attach a little storage hutch. So there are small holes in the ledge where you could insert dowels to hold the hutch. 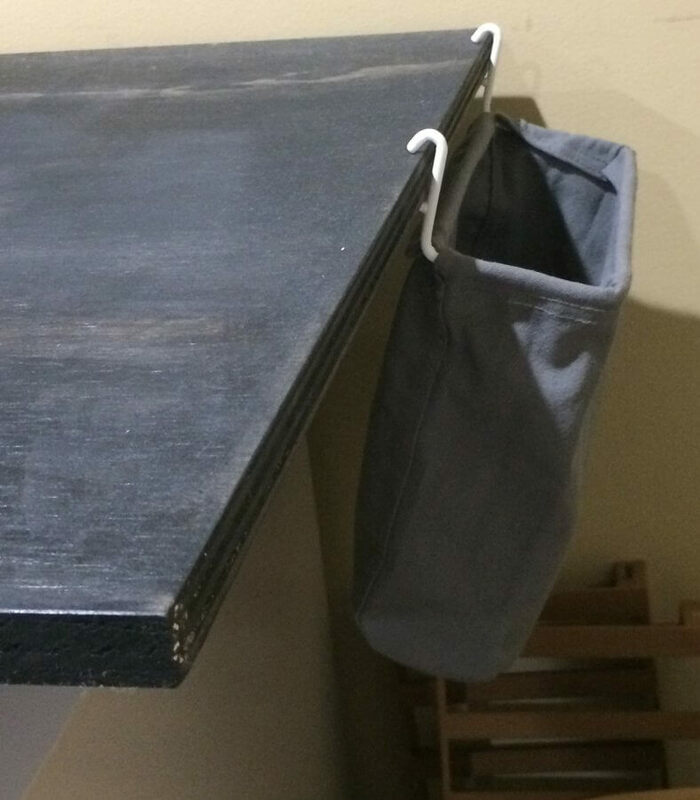 I placed a 25″ by 70″ piece of plywood on top and secured it with dowels in those holes. So, with the modifications, the table sits at a height that is perfect for me. I do think it’s important that you raise whatever table you are using so that it is a height that is ergonomically correct for you. For most of us, this height would be the measurement from the floor to the top of your hips. You should not have to hunch over to cut. Tip: An easy way to get your table a bit higher is to invest in a good set of Bed Risers. Moral: I don’t have a fancy expensive cutting table. I have something better – a piece we had outgrown that has been re-engineered to keep it useful. Before spending a lot of money, look around at what you have and see if any of it can be repurposed. Or check out garage sales and items for sale on Facebook. A little more about the desk: it has two drawers. 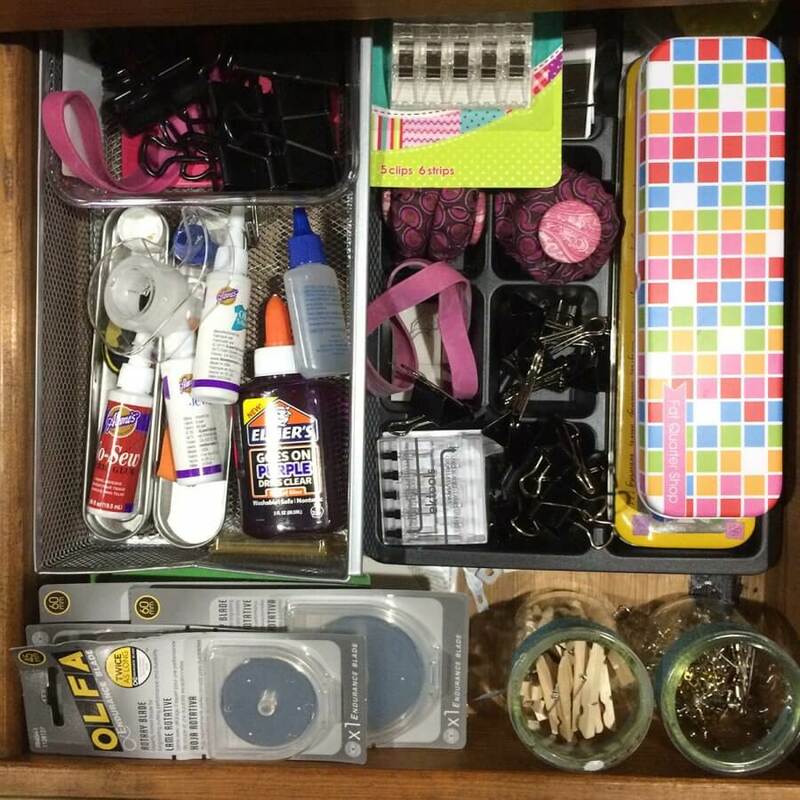 One drawer holds spare rotary blades (Store it where you use it!) 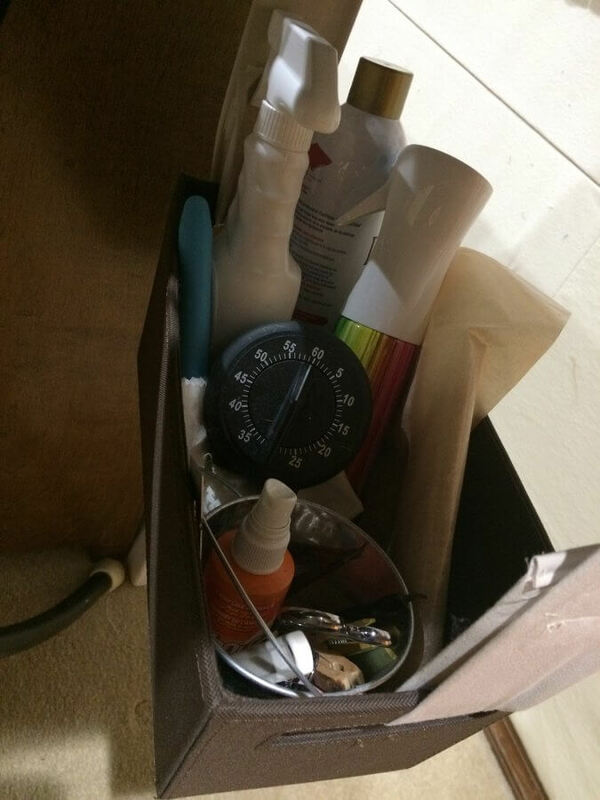 and miscellaneous notions such as glues, pattern weights, binder clips, etc. One of the metal tins holds my good curved safety pins; the other tin holds clips. A neat little cubby area was created in the space between the drawers and the plywood top. 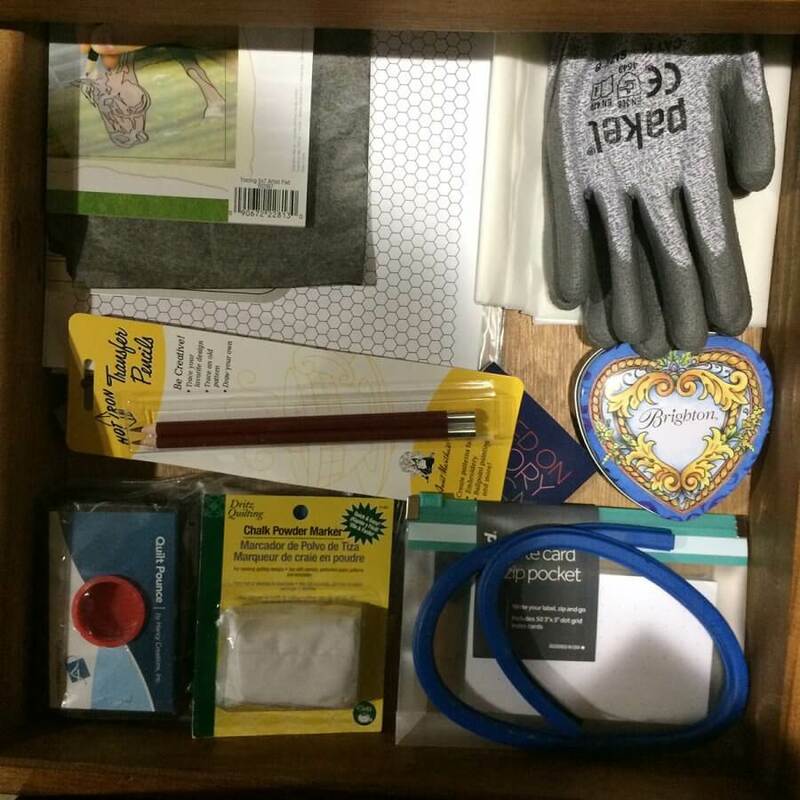 I keep several things under here: Freezer Paper, my set of Karen Buckley Square Rulers (left in photo), a wooden IKEA tray/box with a “hand sewing” kit (This can be grabbed at a moment’s notice and taken to another room. ), and in the right of the photo you can see a turquoise box with my templates (mostly for applique).